Joe Thornton Shooting Like It's 1999? Two of the most well liked members of the Sharks organization. Management got rid of one, wants the other gone as well. One of the few bright spots for the Sharks over the entirety of this first quarter of the season has been none other than Joe Thornton. The player who turned around the Sharks fortunes nine years ago in a mid-season trade is still their best forward. And the notion that the Sharks were hoping to trade him this offseason is one of many reasons a rather large percentage of fans are fed up with management. Not only are Sharks fans confused about why they would want to get rid of him, so are a number of respected media. 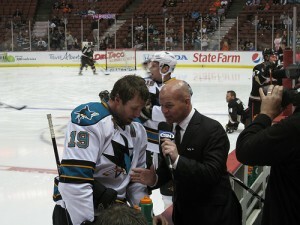 Now on Saturday night the Sharks host the Ducks while looking to end a four game losing streak. The last time the Sharks played Anaheim they were also coming off a four game losing streak. Both times San Jose had lost to a number of bad teams, including league worst Buffalo in both of the streaks. What happened in that first Ducks game you ask? Well, the Sharks cruised to a 4-1 victory and Joe Thornton showed tremendous leadership. The veteran center blocked a shot in the middle of the opening frame and had to immediately hobble off the ice. A few shifts later he came back and dished a laser assist to Joe Pavelski for a power-play goal. Thornton has been nothing short of terrific this season. The man who the coaching staff and upper management decided to take the captaincy away from continues to be their best forward on a nightly basis. During this past offseason Doug Wilson told the public there was an apparent locker room rift last season. However, neither veteran defenseman Dan Boyle nor Brad Stuart seemed to be aware of this apparent “rift”. Now taking the captaincy away from a big personality like Joe Thornton, is that supposed to help this team’s camaraderie? Apparently some don’t take to Thornton’s brand of humor, but if his jokes are a problem for fourth line players, they are the ones who should take a hike, not Thornton. Being around this team on a regular basis, it is quite clear that Thornton and Patrick Marleau are tied at the hip, signing essentially matching contracts to stay together. Thornton and Burns act like they are childhood buddies in the dressing room, and every time he’s asked about Thornton, Logan Couture always calls him the best passer in the world. Not to mention, Joe Pavelski elevated himself to even more of a household name by scoring 40 goals on his wing. Trading Thornton was supposed to be the cure of the locker room? Please. Thornton is having his same typical season production wise but he is also shooting the puck like he did in his Bruins days. He is averaging nearly two shots on goal per game with a fifteen percent shooting percentage to lead the team. Since Thornton has become predominately a passer in his time with San Jose, people forget he twice scored over 35 goals while with the Bruins. In the two seasons with over 30 goals, he tallied 171 and 196 shots. Most of his time in San Jose though he has finished between 120 and 150 shots per year. He is currently on pace for 157 shots. While he has had similar or even higher shot totals as a Shark in the past, his biggest shooting outputs came in his first two full seasons. The league has since gotten much tighter defensively in years since. Last season Thornton finished with just 122. Therefore, being on pace for 35 more shots is a good thing, especially for a team struggling to score goals. Right now Thornton is doing everything he can to right the ship. It’s just too bad his crew members aren’t pulling their weight, just like they didn’t in the 2012 playoff series against the Blues. Thornton was a terrific captain in that series, as he was the best player on the ice by far for either team. Boy oh boy would it be something he ever scored four goals in a game. (<— warning this link includes vulgar language) San Jose might need him to do that just to win a game again. They simply can’t buy a goal in their current skid.